You can enjoy Tranquini all day, everyday. A relaxation drink with ingredients that are known to help relieve stress, anxiety, increase focus without making you feel sleepy. If your mind is full, be mindful instead... So when things get too much & your head is feeling foggy from stress, Tranquini has you covered. A range of lightly carbonated drinks containing herbal blends mixed with theanine from green tea. So helping you clear you mind & finding your flow again. Destressing with bubbles lead to good things happening. The perfect drink for the person who is increasingly prioritising mindfulness & a more actively relaxed life. This past year has become a year for me to focus on myself & clearing my mind. During stressful exam times, I found myself feeling a whole lot less stressed after enjoying an ice-cold Tranquini. Whoop to being Santa today! Thanks to Tranquini, I am positively relaxed & you can be too. You can win 1 of 4 mixed cases of Tranquini. 1. Like As Seen By Lloyd & Tranquini on Facebook or Follow @Lloydi_Boy & @TranquiniGlobal on Twitter. 2. Repost the competition Post on Facebook or Retweet the competition Tweet on Twitter. Remember to include the #12DoCwithLloyd in your post/tweet. 3. Tag 3 friends in your post who also need to be 'Positively Relaxed' this Christmas Season. NB. 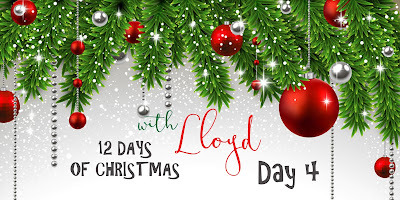 Remember, you have to include the #12DoCwithLloyd otherwise your entry is not valid & can not be counted.